Buckle up. I'm guessing it will be another busy week. But, the craziest part to me was learning that transactions are made public by default. Again, maybe I am old, but why on earth would anyone want to do that? Of course, as a reporter, it struck me as a potential gold mine of information, but I can't think of any good reason why someone would want to share their purchase history and LOTS of reasons why that's a terrible idea. What I'm seeing: I connected to my Facebook feed and contacts purposely to see what I could learn. My friends' purchases ranged from the usual meals and bar tabs, to rugby tickets and a hockey jersey. There wasn't a ton of compromising info, but in addition to my babysitter and several co-workers, I was surprised to see one prominent critic of social media sharing a number of recent purchases. Berlin-based researcher Hang Do Thi Duc discovered even more by sorting through all the publicly available data and posting her findings online. The site profiles a few different individuals, including a cannabis retailer, whose transactions were made public. She was kind enough not to share real names of the merchant or customers, but that info was among the information available. Why it matters: Sharing transaction information publicly could reveal a lot, especially if one makes a lot of transactions over time. While designed for friends, information shared publicly could find its way into the hands of data brokers, credit monitors or others. Our thought bubble: Obviously there are generational differences when it comes to sharing information. That said, there also seems to be a shift in thinking thanks to the Facebook controversies. The assumption from the mid-2000s till recently was that social networks make things better by encouraging sharing. Now there's a wider awareness that everything we share can be used against us. 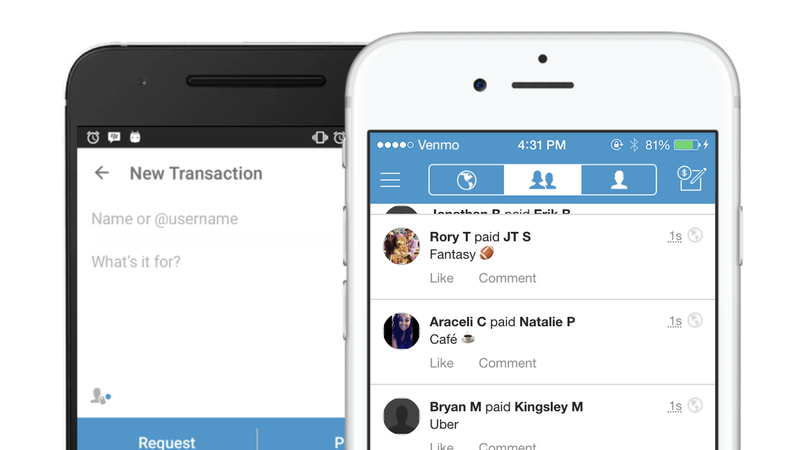 What they're saying: For its part, Venmo says its site was always designed to be social, it doesn't share the amounts paid or publicize what it deems potentially sensitive transactions (those made with a Venmo card or stores that accept Venmo.) The company doesn't plan to change its defaults, but does plan to step up its education efforts. "Our latest app includes a pop-up privacy tutorial that every user will see when they first open the app to further educate the user on how to choose their preferred privacy settings," a Venmo representative told Axios. "Users will see these tutorials over the coming weeks." Meanwhile: Snapchat is giving up on Snapcash, its effort to rival Venmo. The peer-to-peer payments technology, which was launched in 2014 in partnership with Square, is set to shut down at the end of August, per TechCrunch. With 5G, one of the big challenges is getting antennas that can pick up the fragile "millimeter wave" signals that give the new networks their highest speeds. Fret not, Qualcomm says. What's happening now: The chipmaker today announced a family of tiny antenna modules that can handle such waves, all within something about half the size of a paper clip. Device makers will probably use multiple modules, placed either along the bexel of the device, as part of the rear casing. This is one of several new components needed in order to have 5G phones ready to ship in the first half of next year. Qualcomm had announced there would be a 5G modem chip back in 2016 but how the antennas to handle such signals would be managed, though, was less clear. Why it matters: The industry has promised not only that 5G will be on phones in the first half of next year, but that it will arrive on flagship phones. That means size, battery life, reliability and other factors have to be what customers expect from their phone. Qualcomm is using the speed test data that carriers typically use to face off against one another in a new way. The chipmaker says data from Ookla also shows how much faster Android phones with its modems are than iPhones using Intel modems. The details: Ookla has data comparing Android phones that take advantage of its Snapdragon 845 processor to two models of Intel-based modems running on iPhones using T-Mobile and AT&T (the two networks on which Intel modems are used). In all cases, Qualcomm says, the tests show Android phones with Qualcomm's modems are faster, particularly during the "worst case conditions," when Qualcomm chips were more than twice as fast. The performance differences are significantly less dramatic when comparing iPhones with a Qualcomm modem to those powered by Intel, in large part because Apple doesn't take advantage of several of the features of Qualcomm modems, in part to make the two models more similar. Why it matters: Qualcomm and Apple are having something of a squabble, in case you haven't heard. Rumor has it that Apple would like to decrease Qualcomm's role in the iPhone even further. (Currently it uses its own processor and splits the modem work between Intel and Qualcomm.) Qualcomm wants to show iPhone owners what they are missing. New York Times political writer Maggie Haberman posted an essay over the weekend on why she plans to spend less time on Twitter, highlighting a lack of nuance and scale. "Def a problem. Believe we can help solve by showing more context and related conversation." "One of the biggest areas I believe we can help. Helping to determine credible voices per topic in real-time is extremely challenging, but believe it’s possible. Mix of algos and network." The bottom line: Haberman is in a unique position, but the challenges she describes are faced by lots of people on Twitter. Facebook, Google, Microsoft and Twitter announced Friday they are working on the Data Transfer Project, an open-source effort to make it easier for customers to move data from one service to another. "Is the Google Facebook Twitter Microsoft et al data portability the telephone equivalent of letting you leave with your voicemails & your contacts' names, but still leaving you unable to place a call to a customer of another phone company?" Go deeper: The companies published a white paper on the project, its goals and approaches. Google Cloud Next runs Tuesday through Thursday in San Francisco. Lots of earnings reports this week, starting with Google parent Alphabet later today. Also on tap this week are AT&T, Verizon, Facebook, Qualcomm, Intel and Twitter, among others. Facebook suspended ominously named analytics firm Crimson Hexagon for potential data abuses. Meanwhile, the company may be ditching its drone-based internet effort, but it's one of a number of companies eyeing satellite-based delivery. British publisher Future, which publishes a number of tech magazines, is buying Purch, the company that owns Anandtech and Tom's Hardware, for $132.5 million, Digiday reports. As well-funded tech companies are getting into the highly regulated scooter and bike-share business, subsidies for certain groups like low-income communities and students is emerging as the next battleground. Meanwhile, in more Uber news, one driver in St. Louis was live-streaming his rides without passengers' knowledge, while the Miami Herald reports that there is an increase in "vomit fraud" where drivers falsely report bodily fluid damage to collect a cleaning fee. A new nonprofit, called the Energy Consumer Market Alignment Project (EC-MAP), is launching today and will seek to use emerging digital technologies like blockchain to advance energy and climate-change goals. Check out some of the crazy images captured on Google Street View.